Our goal is to make innovation more inclusive. 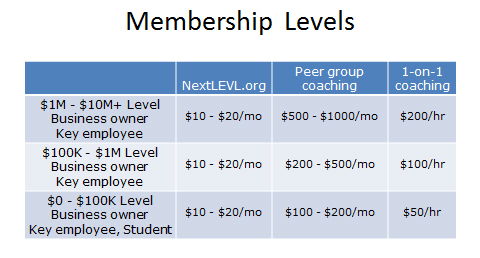 We continually strive to create ways to keep our membership fees as low as possible — ranging from $10 per month for pre-revenue startups and students just wanting to use our coaching app, to $1000 per month for peer groups of businesses over $10M per year in revenue. We do NOT sell advertising and do NOT require equity shares.